Before outlining a storm plan for your yacht, consider whether your boat will be hauled, secured in a marina or private berth, or moved to a safe predetermined location. Consider the following tips when creating your plan. If using a trailer, ensure that both your trailer and towing vehicle are in good operating condition. Fix flat tires, faulty brake lights, etc. Identify a safe, accessible destination, preferably in a hurricane-proof storage facility or garage. If possible, negotiate a storage contract in advance. If you cannot use a trailer, negotiate contractually for a boatyard haul-out at a facility equipped to accommodate your boat and not endangered by a storm surge. If your boat is berthed in a marina, determine what the hurricane procedures are directly from the dockmaster and know your responsibilities. 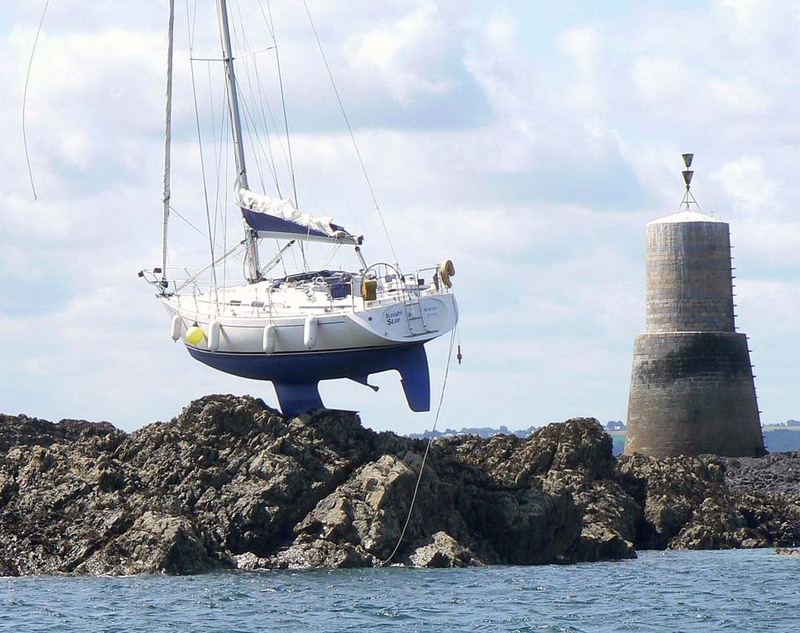 If berthed at a private dock, coordinate mooring arrangements with your neighbors. Inspect your boat’s deck hardware and make sure that all cleats, winches and chocks have suitable back plates and bolts. Purchase a second set of mooring lines and extra fenders, fender boards, chafing gear, back-up batteries and anchors. It may be difficult to buy supplies immediately before a storm. Develop an alternative plan. Depending on the force and direction of the storm, your current berthing location may not always be the safest. Potential obstacles, such as bridges, tidal or depth restrictions, etc. Some bridges may be closed for land evacuation. Check with your local marine or law enforcement authorities for further information. Plan how/where you will secure your boat. As noted, inspect your deck hardware and identify the equipment needed to moor safely in this location. Keep a battery-powered radio, as well as a supply of batteries, to receive the latest weather information. Do not plan to leave your boat on a boat lift. Employ one of the strategies noted here. Make a checklist of all items that will need to be removed from onboard. Store any tools that will be needed to remove electronics or other installed items. Estimate how much time it takes to remove and/or secure gear so that you can plan accordingly. Keep a folder with all of your boat’s relevant paperwork/information in a safe place off the boat. Include copies of your insurance policy, registration, marina contract and equipment inventory. Also list important telephone numbers, such as your insurance broker, harbor master, Coast Guard, etc. IMPORTANT: Share your severe weather plan with a reliable person who can execute it in your absence. If you are an absentee owner, formalize this arrangement with a contract. If your boat is on a trailer and not in a hurricane-proof facility, haul it to a safe area and place wooden blocks between the frame member and the axle inside each wheel. Remove all movable equipment, including canvas and sails, as well as the batteries and outboard engine. Securely strap your boat to the trailer and let half the air out of the tires. Depending on the type of boat, you may want to fill it roughly 1/3 full of water to help hold it down. The blocks will help prevent damage to trailer springs due to the additional weight of the water. Using heavy lines, lash down your boat to fixed objects or to heavy objects buried underground. Due to rotating winds, try to secure your boat in all four directions. Remove all portable equipment (canvas, sails, dinghies, etc.) and valuables. Secure fenders and heavy-duty fender boards. Double all lines and equip them with chafing gear. Set crossing spring lines fore and aft. Remember: nylon lines will stretch up to 5–10%. Due to the risk of tidal surge, make certain that all lines are attached high on pilings. Install preventers at the top of pilings to stop lines from slipping off the top. Make sure that batteries for automatic bilge pumps are fully charged. If necessary, install back-up batteries. Shut off all other electrical devices. Ensure that fuel tanks are full, fuel filters are clean, batteries are charged, bilges and cockpit drains are clear and lifesaving equipment is easily accessible. Set your boat’s anchors to minimize its ability to swing in too wide of an arc. If you decide to move your yacht to waters outside of the hurricane threatened area, make the move well ahead of the storm and carefully monitor weather forecasts. Allow enough time, fuel and crew to make the move safely. Check your boat as soon as it is safe to determine its condition and security. If damage has occurred, take all necessary steps to minimize or prevent further loss. If your boat is in the center of a canal, river, etc., move it to a location where it will not hinder other vessels. Contact your independent insurance advisor to report any damages and to file a claim. If there is evidence of theft or vandalism, file a police report. Note the report number and, if possible, obtain a copy of the incident report.